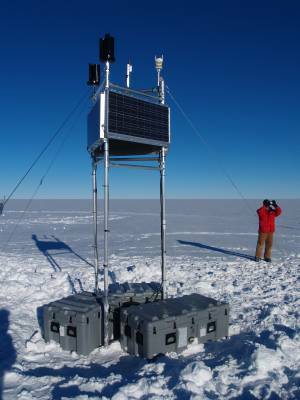 Four continuous GPS stations were installed as part of the POLENET Antarctica network during the 2010/11 field campaign. Three planned stations remain uninstalled due to inclement weather in West Antarctica, and one station remains uninstalled due to lack of suitable bedrock site in the target area. 23 stations installed during the previous three seasons were visited to upgrade them to the latest designs and configurations, and in several cases to repair the sites. Data from three of these sites are transmitted via point-to-point radios while the remainder are transmitted via Iridium modems to the Boulder Facility, where all data is archived automatically. Currently there are 39 stations in the POLENET Antarctica network. The project is part of the International Polar Year (IPY) and the international POLENET consortium. The project's goal is to determine the vertical velocity field associated with ice mass changes. 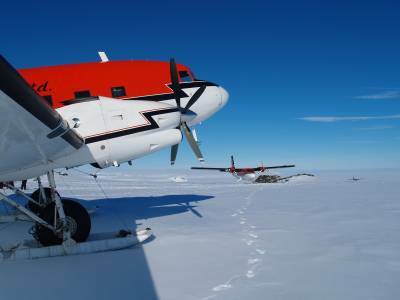 The results will be used to correct satellite measurements made of the Antarctica Ice Sheets. Figure 1 - Three ski-equipped aircraft at Thurston Island. Three independent instrument stations were installed on this trip: Geodetic CGPS, Broadband Seismic, and an Automatic Weather Station. Figure 2 - CGPS station at Upper Thwaites Glacier after being dug out from 10 ft. of accumulated snow and rebuilt on the surface. 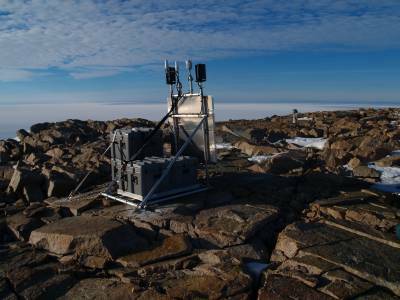 Figure 3 - Newly-installed Geodetic CGPS station at Bear Peninsula, representing UNAVCO's current remote polar GPS station design.